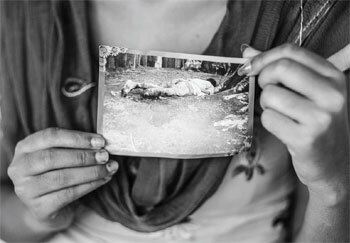 Purnima was 13 when her father was taken away, his leg cut off and finally shot dead. Her brother was also severely tortured, and is disabled. Purnima herself was forced to become a child soldier. Today 23-year-old, Purnima earns Rs 3,000 a month and supports her remaining family. She has got no support from the government. Here she is holding a picture of her murdered father. Children who witness and grow up in war zones, and survive natural disasters in which they lose family members are less likely to develop healthy and strong attachments in relationships when they grow up, studies have shown. They have difficulty controlling or expressing emotion, act violently or inappropriately, and the trauma scars them for life. There is no accurate count of how many young adults today were children who witnessed violence during the conflict, but they can be found in every school and workplace. And every year more children are being added who have survived natural disasters and need counseling. Although the government has addressed the needs of those physically wounded during the conflict, compensated others who have lost property, the psychosocial impact, especially on children, remains largely unaddressed. Bouchard partners closely with an orphanage in Nepal. “I advocate local Nepali volunteering. Orphans are children of the community and it the biggest responsibly falls on community,” says Bouchard. In many orphanages and children’s organisations in Nepal, there is focus on food, shelter and education but only minimal attention is given to the mental well being of a child. The children tend to engage more in self-harm and excessive risk taking behavior, and are more likely to enter the juvenile justice system. Children who experience mental trauma may dissociate from real life. They say they feel detached from their bodies and that they are watching themselves from the outside. After witnessing war or the violence of natural disasters, children cannot unsee it. The children are more likely to have problems thinking clearly, reasoning and problem solving or planning their future. Self-worth and self-esteem can be severely affected by trauma. Children can develop a sense of worthlessness and tend to blame themselves. They feel shame, guilt and suffer from poor self-image, which tends to carry itself to adulthood. War and military conflict studies show the traumatic events of the war lead to the development of post-traumatic stress disorder (PTSD) in children and need psychological intervention. Seeing bodies, especially of relatives, hearing exploding artillery shells or the sound of helicopters are known to have long term effects such as depression and panic attacks in young Nepali survivors of the war. It is possible to treat PTSD, and cognitive behavioral therapy is helpful. Medication can also help temporarily to treat symptoms such as anxiety, sleeplessness but not the condition. Social support from family and community is the most helpful, and individuals with a strong and reliable support system have a better chance of getting better. The older ones look out for the younger ones at the Centre, which also tries to get the children adopted by relatives. Gurung says the children do get depressed, but they pick themselves up as they have psychosocial support from each other. Trauma survivors need well-trained psychosocial workers to help them. Mental health workers need to acknowledge the severity of trauma. It is important to convey an expectation of full recovery. Do not make assumptions and do provide a consistent pattern in support. Pay attention to signs, triggers and what upsets them. Nagendra Luitel of Transcultural Psychosocial Organisation in Kathmandu had conducted a randomised control study among conflict affected children in 2007 to evaluate effectiveness of school-based psychosocial intervention. Psychological distress in children includes extreme shock, sadness, impaired concentration and social reluctance. There is hope that they can get better with the right support, medication and time. Srijana was 12 when the Army took her father away from their village in Palung of Makwanpur in 2002 and killed him. After the initial shock, she pulled herself together for a while and out of a sense of revenge, joined a Maoist cultural troupe in Kathmandu. But her mental state deteriorated as she relived the horror of losing her father one more time. She was taunted by the guerrillas for being “weak”. Her mother said that when she came back, she was depressed again. When Nepali Times met Srijana recently, she had gone through with an inter-ethnic marriage with a non-Tamang and her family had ostracised her. She was on medication. Her brother refused to let us talk to her in depth, and Srijana held her head down while her brother threw a tantrum and asked our photographer to delete all the pictures. The trauma of war affects not just Srijana, but her family. Srijana is now 25, and among thousands of young Nepali men and women whose childhood trauma continues to disturb them into adulthood.